This fabric jumped in my cart at the fabric store. I knew I had to do something with it but what? I also knew it had to be something smocked, so I pleated and blocked it. Then it was off to the collection of floss. I picked a few colors I might use, not to sure yet. So far this is where my direction seems to be going. Now, I have to work out the details. I am sure most sewer's know just where they are going with a project. They have the pattern, fabric and smocking plate along with the floss color all picked out ahead of starting their project. Just doesn't seem to be as interesting to me. So we will see, just what happens here. Zoe models her new duds: She loves her "white Chocolate" as it is just what she ordered. Then she tried on her Betty's Butterflies outfit and that one was her very favorite. Hope you try the butterflies they are fun to make. The Easter hunt outfit was also a surprise to her. I was not sure how the top would fit her. After I had it sewn the neckline looked so big!! Once she tried it on and filled it out it was just fine and I worried for no reason. This one is Betty's butterflies: The pattern is simplicity 2464 a Daisy Kingdom design. Last outfit but I think the most fun. Probably because it was so quick to make is her spring, hunting for eggs outfit. The pattern is McCalls 4006, which has many variations. Sharing with you another blog contest. I love when I find one of these and I must thank Shirley C for this one. Drop in at ourlittlemissthing and join. I am not a quilter but, my favorite fabric shop is a quilt shop. 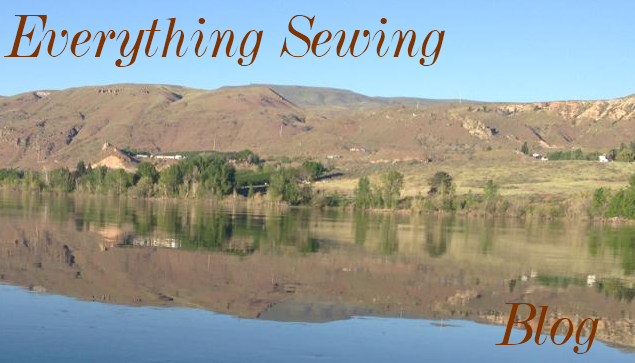 The ladies are warm ,friendly and helpful.When you go in to the store it is more like going to visit a friend and spend time in their sewing room. The only difference is, here I can pick out fabric and take it home with me. Not sure a friend would like that very much. This is The Attic window Quilt shop here in Wenatchee. They make it possible for the Apple valley smockers to hold their meetings,by providing a meeting room. They also made room for us to share our trunk show. I hope you also visit their shop as they now sell fabric on line. This is what some might think of as heaven. Every nook and cranny is full of inspiration. They also have classes and I promise myself I will take one of their classes. Yet another jacket and purse!. I am so glad I took an extra picture of just this little jacket as I have had so many ask me about it. There was no pattern given but, it looks simple enough to copy. The little bee is machine embroidery, other then that it is pretty basic. What I love about the jacket is her treatment of the lining. The gingham used to line it is a large size gingham and then she used a smaller gingham to make the bias. So for those that have asked here is another picture for you. 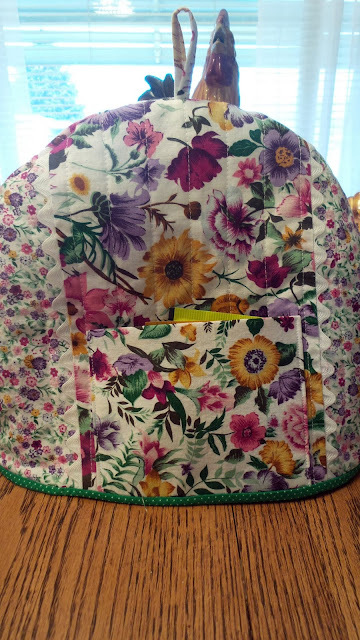 In addition to the jacket, there is also a little purse. What a cute set!! This is inspiration for sure. Today, I will share two little jackets form the trunk show. The first one is a matinee jacket and bonnet with smocking. Delicate lace is used on the bonnet and collar. this is just such a sweet set. This little jacket and bonnet, feature the most beautiful, delicate touches of embroidery. Here is a sneak peek at the SAGA trunk show. If you belong to a smocking group and haven't invited the trunk show, your missing some wonderful works of art. The garments come from all over the states and it is a way we can enjoy each others work and be inspired by friends we will probably never meet. The Attic window quilt shop cancells classes for the day of our show, pushes tables together and gives us the run of the store. They are a wonderful group of ladies and I thank them for all their help. I think if I had to pick a favorite, it would be this rose print dress. Not the type of fabric one might pick for a smocked dress, it is so well done I think I might just have to make one. I love how she used the pink dot fabric as the accent pieces again out of the box thinking. The dress is so much prettier in person, wish a picture could capture it's beauty. Not all of the items are smocked. There is wonderful needle work and white work. Items range from dresses to pillow covers.